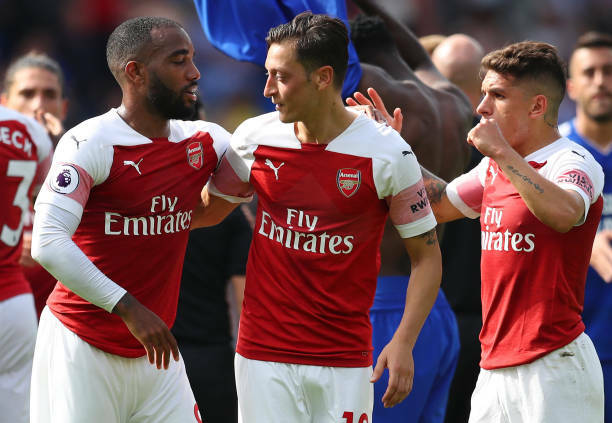 Lucas Torreira has extolled his Arsenal teammate Mesut Ozil and is elated to be in the same squad as the revered 30-year-old, who’s incidentally been touted for a potential mid-season move away from the Emirates. Before stepping down from his post in the Gunners’ dugout, Arsene Wenger handed Ozil a mega £350,000-a-week contract to make him the club’s highest paid player, an eye-watering pay packet that amplified his enigmatic stature within the fold. Under Unai Emery’s command, though, Ozil’s game time has been at a premium, and as he hasn’t featured for Arsenal since Boxing Day, the German craftsman’s immediate future at the north-Londoners has been plagued by doubt and speculation. Ozil’s an experienced figurehead within the modern game and his class, presence and guidance has positively affected a plethora of developing professionals over the course of his glittering career. None more so than Torreira, it seems. “I’m really motivated to be a part of this team and I want to continue growing as part of this squad, which I think is a very good one. “It’s incredible really to be able to be in the same squad as a player like Mesut Ozil and obviously other players too, players that have achieved a lot and have great quality. It makes me proud. Since joining Arsenal in the summer transfer window before the start of the 2018-19 Premier League campaign, Torreira has weathered to life on English soil and has forged himself a firm spot in Emery’s matchday selection. Although Ozil’s seemingly surplus to requirement as it stands, working and battling alongside one of Europe’s most ingenious technicians is evidently a privilege for the aspiring Uruguay international. Torreira has to be nurtured and Ozil, given what he’s accomplished since graduating from FC Schalke 04’s youth ranks, could be the man that elevates the South American’s game to the next level if he remains at Arsenal indefinitely. Share the post "Lucas Torreira extols Arsenal teammate amid transfer speculation"